Cooking Beats – Raíces sees guest chefs from a variety of colourful backgrounds helming Kilo Kallang's kitchen to serve culinary-comforts they grew up on back home, accompanied by a special selection of music to offer diners a fully immersive glimpse into the chef's culture. 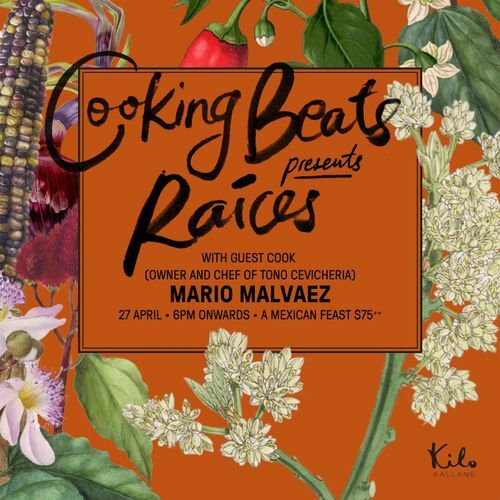 We’re into our third instalment of Cooking Beats—Raíces, this time with guest chef Mario Malváez bringing a Mexican touch to Kilo. Mario is no stranger to the F&B industry—the man has spent time in world-class restaurants around the world like Gaggan in Thailand and Central in Lima, and was the former head chef of Super Loco and Lucha Loco in Singapore. Mario's getting ready to open his own restaurant soon, but in the meantime, he's excited to bring flavours close to home, but influenced by his travels, to Kilo Kallang. Walk-ins welcome, subject to availability.